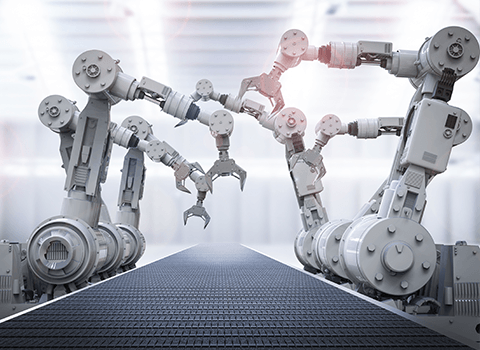 For more than half a century, robotics has played an ever-increasing role in manufacturing, successfully transforming industries ranging from automobiles to electronics to consumer goods. 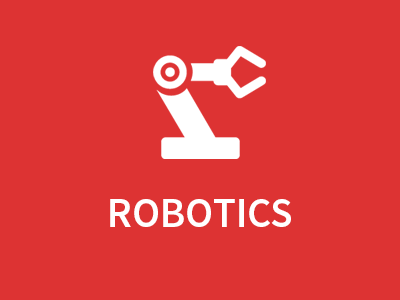 Robotics brings productivity, cost-efficiency and often greater safety to a repetitive task. Industrial robotics continue to evolve, offering greater functionality, flexibility, range of motion, speed and precision. For robots to operate in these ever-more-complex ways, they must be able to collect and process a great deal of sensing data about the environment. Common technologies for detecting obstacles include radar, cameras, optical time-of-flight, ultrasonic, and capacitive sensors. Radar, optical, and ultrasonic sensing transmit radio-frequency waves, light and ultrasonic waves (respectively) and listen or watch for the echoes that reflect back from any obstacles. Radar sensors use antennas to find reflected radio-frequency waves. Optical Time-of-Flight (ToF) sensors use a photodiode to capture reflected light waves from obstacles. So, it’s not surprising that as robotic technologies advance, so do complementary sensor technologies. Much like the five human senses are able to establish location, the different sensing technologies offer the best location information when deploying robotic systems into changing and uncontrolled environments. Industrial robots are normally fixed to a position and designed to perform repetitive tasks quickly and with high accuracy. They are controlled by a robot controller placed in the base of or next to a robot arm. Logistics robots often operate in warehouses or within defined spaces at a factory site where they carry objects from one place to another. To do this, they sense for location for mapping and environmental conditions. Logistics robots are battery-powered, which requires good management of the available power budget. 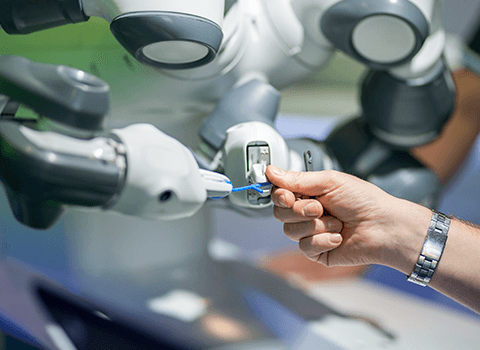 TI demonstrates an industrial robot arm, providing a glimpse into the future where robots will take the more simplistic tasks performed by business people. Collaborative robots are a subgroup of industrial robots designed to interact with humans. To ensure safe collaboration, these robots integrate many sensors to determine location and proximity of objects, such as the humans in the room. These sensors are also used to prevent the bumping against a human or an object, with a automatic consequence of shut-down. Service robots are commonly used in households. 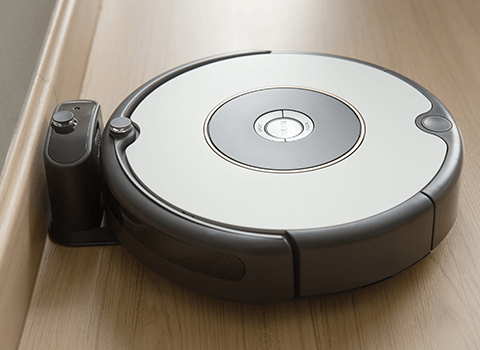 Typical examples for service robots are vacuum cleaners or lawn mowers. 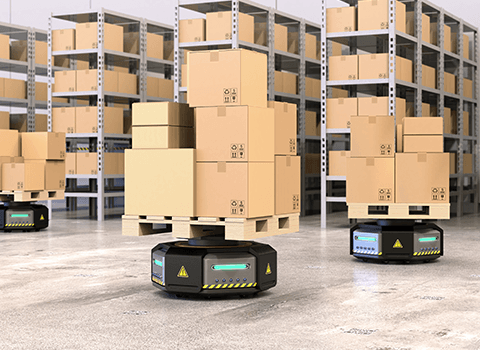 Similar to logistics robots, service robots also rely on sensors for location and mapping. However, due to the size of the robot, the safety concept is less critical. Transmits 30 GHz and 300 GHz signals and listens for the echoes that reflect back from obstacles. Camera solutions are at the core of machine vision in factory automation and logistics. A remote Light Detection and Ranging sensing method that uses pulsed laser light to measure variable distances. Transmits ultrasonic waves and listens for the echoes that reflect back from obstacle. Supports Human-Machine-Interface (HMI) capacitive buttons, sliders, wheels, and proximity sensors. Millimeter Wave (mmWave) belongs to the class of radar sensors. mmWave is an extremely valuable sensing technology for long range detection of items. This sensing technology is a contactless-technology which operates in the spectrum between 30GHz and 300GHz and provides range, velocity and angle information. Due to the technology’s use of small wavelengths, it can provide sub-mm range accuracy and is able to penetrate certain materials such as plastic, drywall, and clothing. This sensing technology is also impervious to environmental conditions such as rain, fog, dust and snow. Texas Instruments has two families of mmWave sensors, AWR mmWave sensors for automotive and IWR mmWave sensors for industrial, building automation and medical applications. Robot mapping and navigation data is a critical component for logistic, collaborative and service robots. This video demonstrates how Texas Instruments’ (TI) millimeter wave (mmWave) radar sensors can be used in robotics to build the location map and perform collision avoidance for navigation. The video is done with a single IWR1443 EVM mounted onto the TurtleBot 2 Robot OS reference platform. TI uses available Robot OS libraries, move base, and OctoMap with the standard TurtleBot odometry libraries. They then interface the IWR1443 EVM to Robot OS using the TI developed TI mmWave ROS package which can be downloaded from ti.com for you to replicate or prototype your own Robot OS system. The level of a robots sensing range resolution is a critical component for logistic, collaborative and service robots. mmWave sensors transmit signals with a wavelength which is in the millimeter (mm) range. This is considered a short wavelength in the electromagnetic spectrum. This short wavelength offers advantages by requiring a small mmWave signal antenna and rendering high resolution velocity, range, and angle results. A 76-81GHz mmWave system resolves velocity, range, and angle accuracy to a millimeter range. The transmitting signal can take the form of different types of waveforms, including Continuous Wave (CW), Pulsed, Frequency-Shift Keying (FSK), and Frequency Modulated Continuous Waveform (FMCW). The Texas Instrument mmWave Sensors implement Fast FMCW to generate robust operation, rapid sensing and reduced ambiguity in dense scenes. Fast FMCW is also able to provide accurate measurement in both range and velocity of objects enabling mmWave Sensors to provide multi-dimensional sensing. As in the IWR1443 mmWave sensor below, a complete radar system includes transmit (TX) and receive (RX) radio frequency (RF) components as well as analog components such as clocking, and digital components such as analog to digital converter (ADC), micro controller unit (MCU), and Digital Signal Processor (DSP). Texas Instruments (TI) has solved the 30 GHz and 300 GHz transmission/receiving challenges and designed CMOS-based mmWave radar devices that integrate the needed components. For more information, click on the below resources. Camera solutions are at the core of machine vision in factory automation and logistics. Cameras can be used for a broad range of applications including quality control and feature inspection, robot guidance and 3D volume measurements. Cameras can be stand-alone with digital input/output interfaces to a programmable logic controller (PLC), a robot controller, or with high-speed interfaces all to allow further remote processing. Texas Instruments offers solutions to help solve challenges when designing camera solutions for factory automation and logistics. The detection performance of a industrial camera depends on the recognition of patterns. This video shows how to select the resolution that you need for your application, and the effects of different configuration settings. The calibration of the camera and system enhances the system’s machine vision. This video will present camera calibration techniques using the 3D Machine Vision software development kit. You are going to learn about the process of calibration for Machine TI Designs. We’ll discuss both parts of calibration, the camera and the system and we’ll also discover some best practices for calibration. LIDAR belongs to the class of optical sensors. LIDAR, which stands for Light Detection and Ranging, is a remote sensing method that uses light in the form of a pulsed laser to measure variable distances of a target. LIDAR sensing is an extremely valuable sensing technology for long range detection of items. The sensor is a combination of a light generating device, such as an light emitting diode (LED) or laser, and a photo sensing element such as an avalanche photodiode (APD) enclosed in the device. The light emitting device generates light pulses. The reflection of these light pulses — combined with other data recorded — generate precise, three-dimensional information about the shape of the target and its surface characteristics. Texas Instruments’ (TI’s) 3D Time-of-Flight products, tools and development kits enable the next generation of machine vision with real-time 3D imaging depth. From robotic navigation to gesture recognition and building automation, TI’s 3D Time-of-Flight chipsets allow for maximum flexibility to customize every aspect of your sensor’s design. This video will give a overview laser range finding techniques using high speed signal chain devices. This is followed with a discussion concerning appropriate analog-to-digital converters. We will then go into the lab and demonstrate the results for a Lidar device using a multi-frequency-continuous wave (MFCW) pulses. 3D Time-of-Flight (ToF) robotics: This obstacle detection video demonstrates how a TI 3D Time-of-Flight solution can be used for obstacle detection, collision avoidance, and navigation. TI’s 3D Time-of-Flight sensors work by illuminating the scene with modulated light and measuring the phase delay of the returned light. The phase delay is proportional to the actual distance. This video will demonstrate how Texas Instruments (TI) 3D Time-of-Flight (ToF) solution can be used for obstacle detection, collision avoidance, and navigation. TI 3D Time-of-Flight sensors work by illuminating the scene with modulated light and measuring the phase delay of the returned light. In this video you will see how to apply 3D Time-of-Flight sensors for gesture control. TI 3D Time-of-Flight sensors work by illuminating the scene with modulated light and measuring the phase delay of the returned light. The phase delay is proportional to the actual distance. Every pixel in the TI solution performance measurement in parallel, resulting in a depth map. 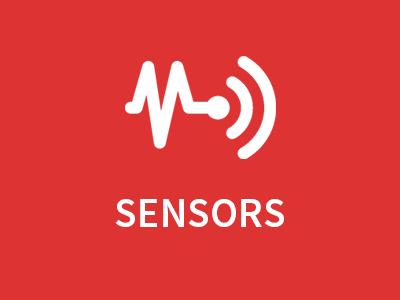 Ultrasonic sensors transmit ultrasonic waves and listen for echoes that reflect back from obstacles. Ultrasonic-based obstruction avoidance robot systems use ultrasonic transducers, where piezoelectric oscillating crystals generate ultrasonic sound waves when an AC voltage is applied and vice versa when the echo returns. The ultrasonic sensor network maps obstructions, calculates the distance from obstacles and feeds this information to the system’s central processing unit (CPU). Ultrasound waves can travel through a wide variety of media (gases, liquids, solids) to detect objects with mismatched acoustic impedances. The speed of sound is the distance per unit time by a sound wave as it propagates through an elastic medium. For example, in dry air at 20°C (68°F), the speed of sound is 343 meters per second (1,125 feet per second). Ultrasound attenuation in air increases as a function of frequency and humidity. Therefore, air-coupled ultrasound is typically limited to frequencies below 500kHz due to excessive path loss/absorption. The ultrasonic solution is a slower-speed, low-power, alternative to higher speed radar sensing systems. Ultrasonic sensing is more reliable than optical time-of-flight for obstacle avoidance, as ultrasonic sensing is not affected by the amount of available light reflected off of obstacles. The ultrasonic technology is ideal for detection of surfaces, liquids, clear objects, and objects in dirty environments. TI’s portfolio of highly integrated ICs enable wide distance detection range up to 11m for applications including ultrasonic park assist, automotive kick-to-open, and drone landing assist. In ultrasonic distance-ranging automotive applications such as ultrasonic park assist (UPA) and blind-spot detection (BSD), ultrasonic waves transmitted by the system are reflected by objects present in the vicinity. The system receives the reflected wave, or echo, and compares the object’s echo amplitude against a threshold to detect the object. The echo for objects that are closer to the system is stronger than that for objects that are farther from the system. Hence, it is relatively common for the threshold to be varied with time. For instance, the PGA450-Q1 device is a fully integrated system on-a-chip analog front-end for ultrasonic sensing in automotive park-assist, object-detection through air, level sensing in large tanks, and distance measurements for anti-collision and landing assist of unmanned systems (such as drones, cameras, and robots). This highly integrated device enables a small form-factor and cost-optimized solution compared to discrete ultrasonic-sensor solutions. The PGA450-Q1 device can measure distances ranging from less than 1 meter up to 7 meters, at a resolution of 1 cm depending on the transducer-transformer sensor pair used in the system. Ultrasonic sensing time-of-flight (ToF) measurement techniques can be utilized to measure fluid levels in tanks. Those measurements can either be done from inside or outside the wall of the tank. In automotive, industrial and even medical applications the ability to perform non-invasive measurements is driven from the target fluid’s corrosiveness and/or sterile requirements. The utilization of the TDC1000 and piezoelectric ultrasonic transducer produces highly accurate fluid level measurements on a tank externally. For instance, the TDC1000 is a fully integrated analog front-end (AFE) for ultrasonic sensing measurements of level, fluid identification/concentration, flow, and proximity/ distance applications common in automotive, industrial, medical, and consumer markets. When paired with an MSP430/C2000 MCU, power, wireless, and source code, TI provides the complete ultrasonic sensing solution. There are several methods for noninvasive level measurement. However only ultrasonic ToF techniques can measure tank levels from outside conductive tank walls, which is the case for metalized plastic. Ultrasound has no moving parts and using a 1 MHz transducer will yield sub-mm accuracy. Ultrasound also isn’t affected by external electric field changes which can be an issue with other sensing technologies. Ultrasonic ToF level measurement works by using a single piezoelectric transducer to create a pulse from the bottom of a tank. That pulse travels through the tank wall, through the fluid in the tank until it reaches the fluid surface. At the fluid surface (fluid to air interface) an echo is created. Measuring how long it takes for the echo to return is referred to as ToF (Time Of Flight) measurement. Highly integrated system-on-chips enable ultra-low power precision sensing for flow metering applications. For instance, the MSP430FR6047 microcontroller (MCU) takes ultrasonic sensing and measurement to the next level. This powerful, highly integrated microcontroller (MCU) is optimized for water and heat meters. The MSP430FR6047 MCU offers an integrated Ultrasonic Sensing Solution (USS) module, which provides high accuracy for a wide range of flow rates. The USS module helps achieve ultra-low-power metering combined with lower system cost due to maximum integration requiring very few external components. The USS module includes a programmable pulse generator (PPG) and a physical interface (PHY) with a low-impedance output driver for optimum sensor excitation and accurate impendence matching to deliver best results for zero-flow drift (ZFD). The module also includes a programmable gain amplifier (PGA) and a high-speed 12-bit 8-Msps sigma-delta ADC (SDHS) for accurate signal acquisition from industry-standard ultrasonic transducers. Multi-channel, highly integrated analog front-ends for material composition and array applications such as ultrasound, sonar and non-destructive testing. For instance, the AFE5812 is a highly-integrated analog front-end (AFE) solution specifically designed for ultrasound systems in which high performance and small size are required. The AFE5812 integrates a complete time-gain-control (TGC) imaging path and a CWD path. It also enables users to select one of various power/noise combinations to optimize system performance. Therefore, the AFE5812 is a suitable ultrasound AFE solution not only for high-end systems, but also for portable ones. The TIDA-00151 reference design contains a PGA450-Q1 which is a system on Chip (SOC) sensor interface IC for automotive Ultrasonic sensors. It provides all signal conditioning and processing for the transducer echo signals and for calculating the distance between the transducer and objects. MCU and program memory allow for full configurability for the specific end application. Application examples are ultrasonic park assist, self parking, blind spot detection and valet parking. Capacitive touch as a human-machine interface (HMI) technology is finding its way into more and more applications each year. It is rapidly becoming a popular technology for mechanical button replacement in end equipment such as small and large home appliances, industrial control panels and automotive center stacks. All of these represent simple interfaces that can tolerate harsh operating environments subject to noise, dirt and liquids which can interfere with the reliable operation of mechanical buttons. Texas Instruments MSP430 microcontrollers with integrated CapTIvate technology brings together a new capacitive touch measurement technology, a powerful CapTIvate Design Center GUI, a versatile hardware development platform and a full feature capacitive touch software library, creating the next step in evolution for capacitive touch sensor design. Capacitive sensing is performing a measurement to detect a capacitive change to a sensor element. A sensor element can be any conductive material (copper PCB plane, a wire, etc.) The change can be due to human interaction, such as a finger, ear, or hand. This is often termed “capacitive touch” or “proximity.” However, capacitive sensing is not limited to human interaction. Other objects or materials can change the capacitance of a sensor. This could be an organic or inorganic material. Think metals or liquids. In either case, the interpretation of the change in capacitance is what defines an application. Self Capacitance – Measuring changes in capacitance between one plate and earth ground. Mutual Capacitance – Measuring changes in capacitance between two plates. Capacitive touch interfaces are inherently susceptible to many different types of noise, posing serious challenges to designers looking to integrate capacitive touch into products that require a high level of reliability. Complicating things further, there are a wide variety of capacitive-touch solutions available on the market from various semiconductor manufacturers. 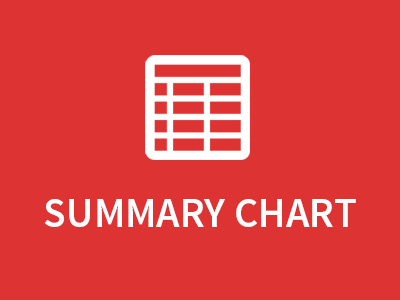 Each manufacturer has a unique approach to measuring changes in capacitance. Evaluating the performance of different capacitive-touch solutions in the presence of noise is difficult because noise immunity is a system-level design challenge. Factors that contribute to the noise performance of a solution include the capacitive measurement technology itself, the hardware design of the system and the software that is used to interpret the raw data and process it into a touch status. MSP microcontrollers (MCUs) featuring CapTIvate™ technology provide designers with a feature-rich capacitive-sensing peripheral that can be configured for ultra-low-energy battery-powered applications as well as applications that require a high level of noise tolerance. In order to demonstrate system-level design principles for creating a noise tolerant solution, TI has certified the TIDM-CAPTOUCHEMCREF capacitive touch TI Design for immunity to conducted noise, electrical fast transients and electrostatic discharge per the IEC 61000-4-6, IEC 61000-4-4 and IEC 61000-4-2 system-level standards, respectively. This design provides a reference for schematic, layout and software best practices when designing for noise tolerance with CapTIvate technology. To help its customers take full advantage of the benefits of touch-based UIs, TI has created the ultra-low-power MSP430FR25x/26x family of MSP430 microcontrollers with CapTIvate™ technology. This video demonstrates a smart, feature-rich, and IoT ready thermostat featuring ITO capacitive touch. ITO stands for indium tin oxide, a transparent conductor that is spotted onto a substrate, like glass or plastic. For this demo, the ITO sensor layer is on top of a QVGA display. This demo includes the MSP430 microcontroller with CapTIvate touch technology, which drives the ITO capacitive touch buttons, sliders, and proximity sensor on top of a QVGA display. It also includes the ultra-low-power SimpleLink MSP432 MCU, which serves as a host MCU for remote wireless connectivity and local functions.